Spring has arrived at the ranch! The days get longer and warmer, our horses loose their thick winter fur, the plants and trees around the ranch start to bloom in wonderful colours and it's less than two weeks left until our first guide lessons of the first Guide School of this season will start. When you hear 'guide lessons', you may be imagining boring classrooms and homework, but rest assured, these guide lessons are anything but mundane. 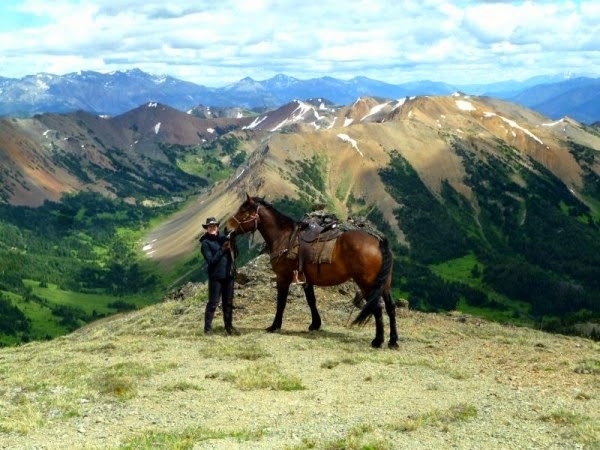 For example, in one of our guide lessons you may be outdoors, learning how to shoe a horse, and the next of your guide lessons will see you on the top of a mountain, viewing animals and enjoying the beautiful view. Creating unique memories with a horse on top of a mountain. Take your guide lessons in the outdoors. Everyone is excited and has started counting the days until the two-week program begins. Some of the students have already arrived at the ranch and they can't wait to begin their guide lessons, and learn everything about horse shoeing, packing, saddling, western mountain riding and camp preparation to become professional guides and being able to survive in the wilderness by training how to be self-sufficient in the back country. Learning how to shoe a horse will be one of your guide lessons. In the last weeks our interns set up the tents, oiled the saddles, trained the horses and got everything ready for the season. Beside that, we had already the chance to see a lot of wild animals in our territory: sheep climbing up steep slopes, a Mountain Goat billy eating the first fresh graze, a lot of deer cheerfully jumping around and on top of that the first Black Bear was seen in Gold Bridge close to our ranch. Hopefully, we will have great chances to see a lot of wildlife during our trips through the blossoming mountains!